Photo: John Edmunds Apartment House, ca. 1928, 2007 East Gadsden Street, Pensacola, FL. Listed on the National Register of Historic Places in 1983. Photographed by User:Ebyabe (own work), 2008, [cc-by-3.0 (creativecommons.org/licenses/by/3.0)], via Wikimedia Commons, accessed June, 2013. 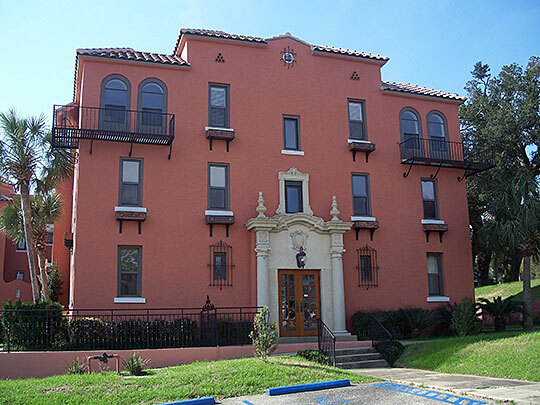 The Escambia County Courthouse is located at 190 West Government Street, Pensacola, FL 32502; phone: 850-95-3920. County administrative offices are located at 221 Palafax Place, Pensacola, FL 32502; phone: 850-595-4902. Escambia County, created in 1821, is one of Florida's two original counties. The name is believed to be derived either from a Creek Indian word (Shambia) meaning clear water or a Choctaw Indian word meaning cane-brake.